Mediaschneider is the number one independent media agency in Switzerland. Founded in 2001, the company boasts a yearly revenue of more than CHF 230 million, delivering services to customers such as Swisscom, Manor and Sanitas. Moritz Schneider leads Operations within their Interactive Team. Staffed with approximately 20 people, this team is responsible for providing online ad campaign services from consulting, planning, and execution, to analytics and reporting. Mediaschneider collects large amounts of media data, including web and social media campaign metrics. Previously, employees tracked these metrics in complex spreadsheets—leading to a time-consuming reporting process. “In the online sector, we are receiving current server data regarding impressions, click, and conversion rates of our web and social media campaigns at virtually the push of a single button. However, processing and report generation for our clients used to be time-consuming and prone to errors, because we were doing it using large and complex Excel spreadsheets,” says Moritz Schneider, Head of Team Interactive. The ad-server hosters provided a wide variety of KPIs, but the team felt that the calculations from which they were based weren’t always trustworthy. Consequently, Mediaschneider decided to implement their own data warehouse to consolidate all the relevant data for online campaigns and run their own, independent KPI calculations. Mediaschneider secured the support of D1 Solutions, a Tableau partner. As Moritz Schneider had already had a positive experience using Tableau during his marketing studies, and there was a huge amount of data to report and visualize, they decided to implement a Tableau solution. After initial performance problems with the on-premise IT, Mediaschneider decided to use the Amazon Redshift cloud infrastructure to build their data warehouse. But the Swiss media expert is aiming even higher: "Going forward, we want to enable our customers to immediately evaluate the success of their campaigns. With cross-channel analysis, for example, they could determine the most successful campaigns and channels, allowing them to plan and use their marketing budgets more efficiently. These kind of services aren't offered at any media agency at this moment. It would go a long way towards increasing customer retention for us." Mediaschneider uses Tableau dashboards to track campaign success. Using Tableau Online, we can provide internal and external users alike with quick web access, without worrying about capacities or CPU performance. 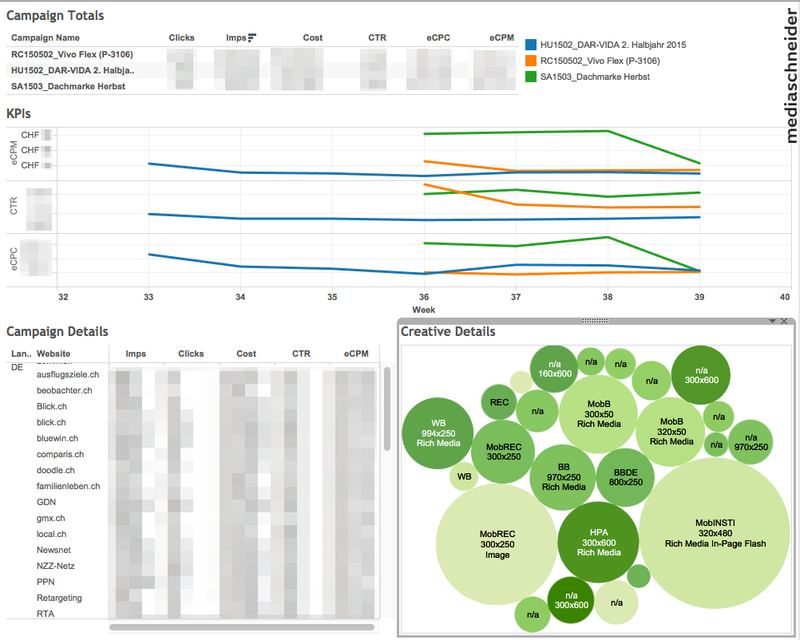 Tableau Online allows Mediaschneider employees to quickly access large amounts of data on the web—speeding up report generation and increasing productivity. “Using Tableau Online, we can provide internal and external users alike with quick web access, without worrying about capacities or CPU performance. 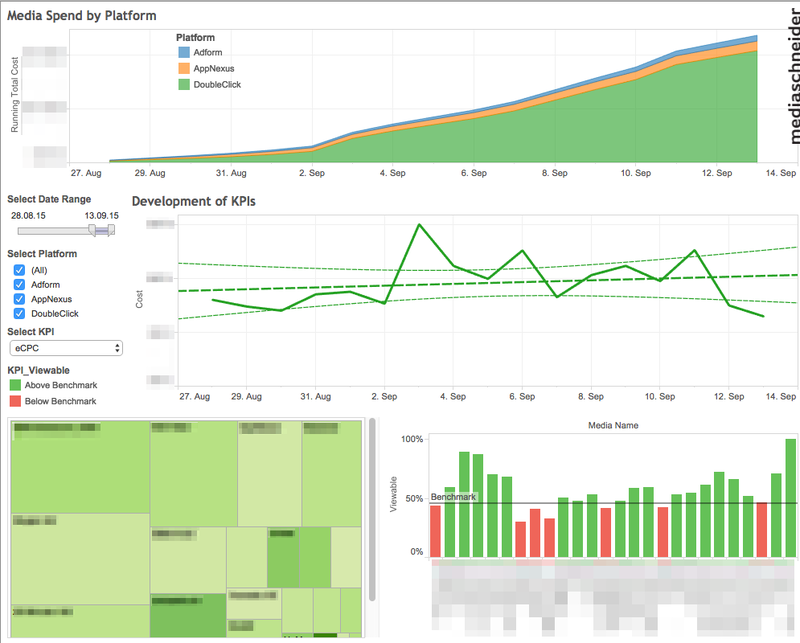 My team makes sure we deliver dashboards that provide exactly the information, KPIs and interactive analyses needed. Compared to the report preparation in Excel we used to do, this frees up significant amounts of time and capacity we can direct towards new challenges,” says Schneider.